VERY NICE SHOULDER BAG Ref. 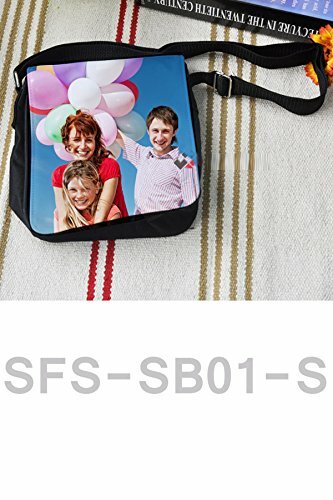 SFS-SB01-S Sizes : 7'' x 9´´ x 2´´ ( 22 x 17 x 6 cm ) approx. Printable Size : 8,5'' x 7´´ inches ( 22 x 17,5 cm ) approx. Press Temperature : 180 C ( 365 F ) Press Time : 60-80 seconds Weight : aprox. 180 gr Color of the Canteen : Black & White Packing : Individual transparent bag DESCRIPTION : Small Shoulder bag is a perfect personalised gift. It can imprint with monogram, logo or any stylish images on the surface. Shipped : From USA. Dispached : 1 or 2 days after your payment is clear. Condition : Brand new, unused, unword ítem. You will received exactly as picture . A great gift for a family member or friend, a bag for your hand luggage on holiday or simply carrying around your wallet, tablet and phone! Sizes : 7'' x 9´´ x 2´´ ( 22 x 17 x 6 cm ) approx.